Weapons: The Panther has retractable claws that are housed in his forearms and are released from his knuckles when he makes a fist. T’Challa is the second son of King T’Chaka, ruler of Wakanda, a small but technologically advanced nation in Africa. T’Challa’s older brother, M’Baku, was supposed to take the Panther Ritual, which involved hunting and defeating a Black Panther, but instead, T’Challa, believing himself to be ready, stepped in and attempted to go through with the ritual ahead of his brother. Once the panther was found, it overwhelmed T’Challa, and ripped him to shreds, doing extensive damage to his throat and vocal chords. T’Challa is found by M’Baku, who calls him a fool, and taken back to the palace for help. M’Baku tells King T’Chaka what has happened, and blames him for it, saying he coddled T’Challa, and made him believe he could be more than he was. After 17 hours of surgery with no success, King T’Chaka reaches out to the Americans for help, offering some of their technology in exchange for their help. M’Baku argues with his father about this, but says T’Chaka would do anything for his favorite son. The Americans turn T’Challa over to the Weapon X Project, which in turn after months of procedures are able to restore all but his vocal chords, and also included other enhancements. Meanwhile, King T’Chaka has been getting the runaround about his son, and is finally able to speak with Nick Fury who informs T’Chaka that whatever arrangements he had with the Weapon X Project was null and void, and that the “Black Panther” is now property of the United States government and they would be in touch. Fury brings the Panther to Captain America and ask him to train him, in order to get him ready for duty on the Ultimates squad. Cap agrees to train him, and takes him out for a test run by having him subdue and capture and enhanced criminal named Elliot Franklin; codenamed Thunderball. The Panther makes short work of him, and afterwards, Cap tries to talk to him, and at least gets him to remove his mask, and he then sees the scars on his throat. Cap confronts Fury, who lies to him about the Panther, and misleads him into believing that the Panther’s father did not want him because he was a mutant and possibly did the damage to the Panther’s throat. Cap takes this with a grain of salt. Cap enters the Panther’s room and sees him reading an article on the computer about the African nation of Wakanda, after questioning Panther about this, Cap finds out that T’Challa is the prince of that country and was told by Fury he couldn’t go home. Cap works out a plan whereas he would stand-in for the Panther on the Ultimates team and allow him to escape home, even though it would be temporary. The Panther resurfaces again, now on the New Ultimates squad, and helps stave off an invasion attempt by Loki. He decides afterwards that he no longer wants to be on the team. 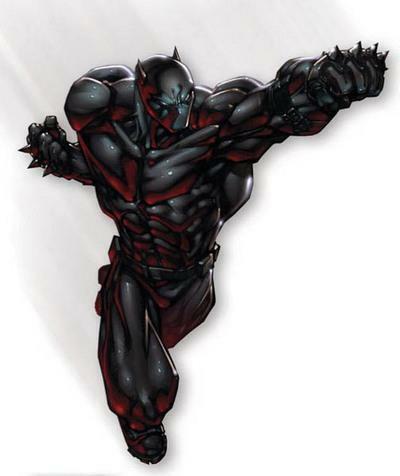 I don’t know about ultimate panther I mean to me he sounds like a cheap imitation of wolverine and to say that the most advanced nation on earth couldn’t heal him so they had to come to the Americans in exchange for their tech they would basically make him a low level weapon x? And captain America is the one who trains him ? Nah,I ain’t feelin that back story. Not for one of if not the greatest black hero in comics. Gotta agree with Erik here, the original backstory was better.